The Teensy is a breadboard-friendly development board with loads of features in a, well, teensy package. 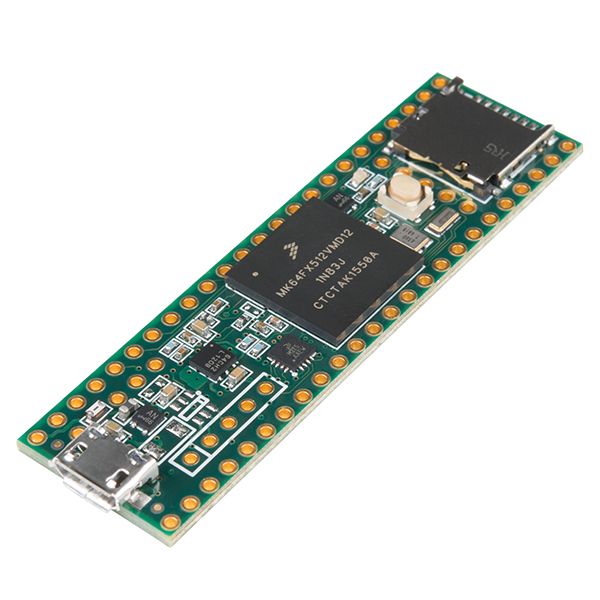 Each Teensy 3.5 comes pre-flashed with a bootloader so you can program it using the on-board USB connection: no external programmer needed! You can program for the Teensy in your favorite program editor using C *or *you can install the Teensyduino add-on for the Arduino IDE and write Arduino sketches for it! All of this functionality is jammed into a 62.3mm x 18.0mm board with all solder points on a 0.1" grid so you can slap it on a breadboard and get to work! 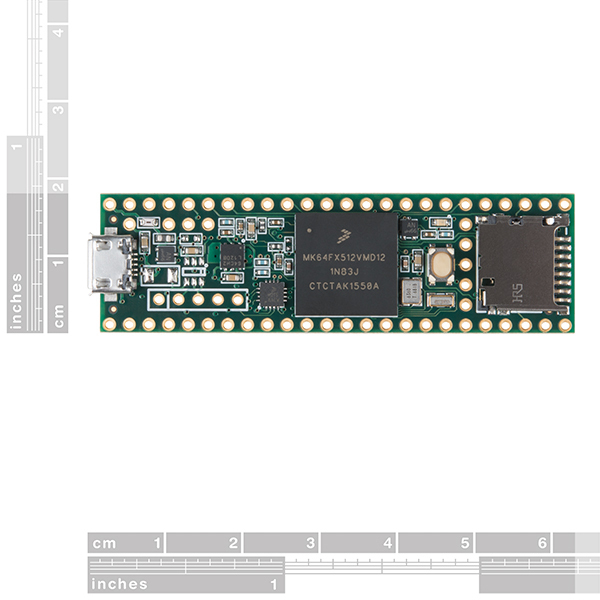 The Teensy 3.5 (as well as its sibling, the Teensy 3.6) is larger, faster and capable of more projects, especially with its onboard micro SD card port. 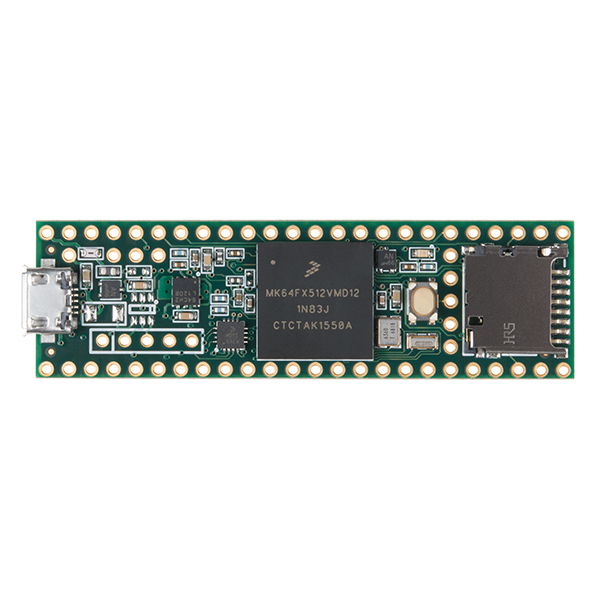 An upgraded ARM Cortex MCU (120MHz from 72MHz), more memory (512K from 256K), as well as more RAM, EEPROM and accessible pins make up the key new features of this "teensy" board. The Teensy 3.5 is slightly scaled down from the Teensy 3.6 but is offered at a cheaper price point, comparatively. I need this thing with soldered pins. Do you have one? We currently only have ones without the pins, but we do plan on getting ones with pins soldered on soon, I believe the manufacture is just building and shipping these first. Keep checking back. OctoWS2811 was updated for Teensy 3.5 and 3.6 on October 21, 2016. This link isn't quite the video demo you wanted, but hopefully the source code and github commit log can give you some confidence it does indeed support 3.5 and 3.6. Excellent! Thanks! While preparing a post over on Adafruit, I noticed that there were what might be a 32.768kHz SMD crystal over between the reset button and pin 25/pin 26, but the resolution of the pics available didnât allow reading the markings (and thereâs no schematic available, at least yet). The pjrc.com website isnât yet listing info about the 3.5/3.6, so was no help either. At $25 a pop, the 3.5 may become my âgo-toâ board, especially for data logging! I bought a couple of 3.5's, and although I haven't yet had time to fire them up, I did, just now, look at that possible XTAL under the magnifying glass. It is TEENSY! (pun intended!) The markings, as far as I can make out are "SDG15A". The DigiKey search engine turned up nothing with those markings, but there are a lot of 32.768kHz SMD crystals that are about that size (about 3.2mm x 1.5mm). Hopefully I'll nave time to solder on some pins and fire one of them up in the next week or so! I've soldered "header" pins onto a 3.5, and cut a m/m jumper in two and soldered one of the pieces to the Vbat connection. It's in a solderless breadboard socket, and at the moment, the only wires go to a CR2032 coin cell. After a little other tinkering to make sure the system was working, I tried out the TimeTeensy3 demo (which grabs the time from the host computer, and sets the RTCC to that). I then modified a copy, commenting out the setting functions (and adding to the message printed so I know that it's the version running). I unplugged the USB for >10 minutes, and when I plugged it back in, the time corresponds to the Mac's time, so it sure looks like the RTC is running! EXCELLENT! Kinetis MK64 are 5v tolerant on digital pins (not analog ones!) Kinetis MK66 are only VDD+0.3v tolerant (so not even 3.3v tolerant it VDD < 3v). Hint: check datasheet asbolute ratings for VDDIO. 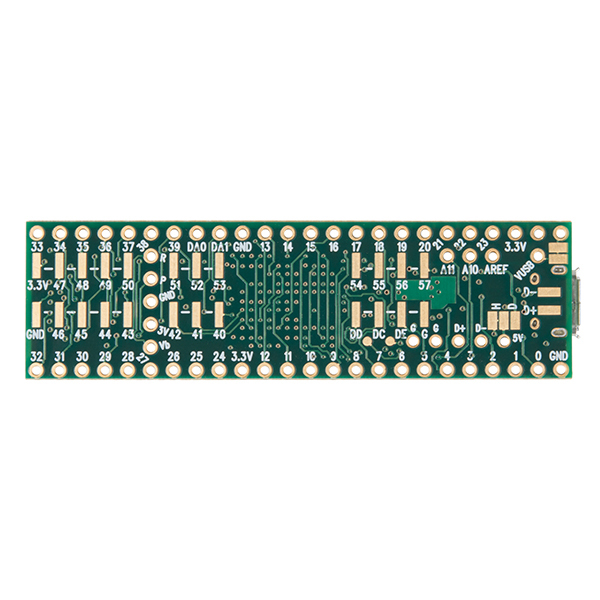 Teensy 3.5 is another great PJRC product! So much power and so many features in a small Teensy package! NOTE: The T_3.5 actually has 256K RAM - just like the T_3.6.